It has been been nine months since my last post, and my life has convulsed into an absolutely different shape. I haven't been able to write about it because, as they say, it was too close. I have decided to do a short recap here to clear the way for what will come. At the time of my last writing, my father's health was declining and shortly after that post, I made the decision to move to Olympia to be near him. I made the trip south from Oak Harbor to Olympia in three days with my sister aboard. She had never been on a sailboat, but picked it up quickly with my gentle instruction. We had a fantastic sail one day from Kingston to Gig Harbor on a 15 knot downwind run. I gained immeasurable confidence on the trip which went smoothly and without incident. 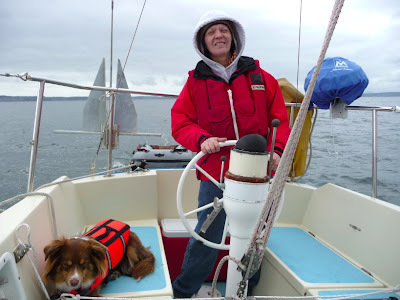 Here is Gail at the helm just off Seattle. Soon after arriving in Olympia, I found a studio to rent for Steve and I to use as an office and home away from the boats. Plans developed, and eventually Steve and I brought Nomadness to Olympia where she was hauled out at Swantown for a bottom job. 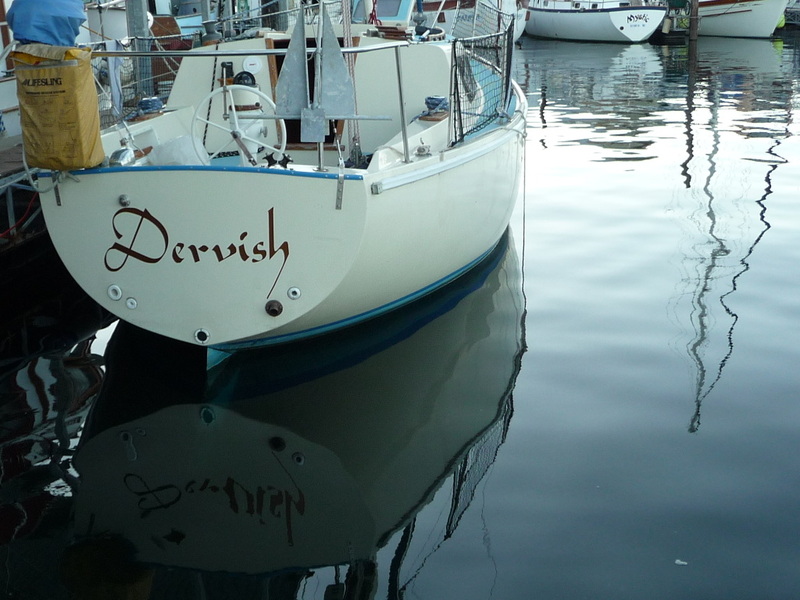 Once the work was done we moved her to West Bay Marina to share an end-tie with Dervish. It wasn't long before Steve decided Olympia didn't work for him, and he resolved to move Nomadness north. Meanwhile my father's health declined and my obligations to family increased accordingly. I became caregiver for my father while living alone in the studio. Then on October 1st, while Steve was sailing north on Nomadness to her new berth in Everett, I was rear-ended at high speed on I5 after having taken my father to Virgina Mason for a consultation. The accident was severe and traumatic. My car was totaled. As it turned out this accident would generate a shockwave through every aspect of my life. By this time, it was clear that the universe was not cooperating with my plans. Nomadness's future no longer included me. I found myself facing months of recovery primarily alone and unable to move aboard. I thank the heavens for my loving and very devoted friends who have helped me through this by chopping wood, bringing food, making me laugh, and just being present with me through it all. Long story short, my father passed away at the end of October from complications following the surgery for which we all had been waiting. There are no words rich enough to capture the heart's story after an event like losing a parent. Dad never boarded Dervish, but I am thankful for those last months with him. Although my personal life was in shambles, my spirit congealed around the understanding of what really matters in one's life: tender moments of compassion and lasting love. 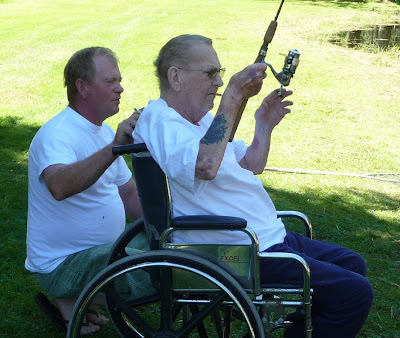 Here are my father and brother on Dad's last fishing trip. I am still in recovery from my accident but doing better each week. My plans for the near future are to get strong enough to move aboard Dervish and reinvent my dream, while striving to keep my heart open. Everything is fuzzy, but focus will come, my core will strengthen, and soon the future will unfold and reveal unimaginable joys and adventures. Right? Meanwhile, I am back to writing. I am currently working on commission to revise a play about the wife of the abolitionist John Brown. There will surely be a post on that as I flesh it out for a public reading. And work progresses on Dervish as well. Current projects include rebuilding the steering pedestal and improving the electrical system; I'll post details of those projects as they come to completion. I might even find my way back to writing a blog about living on a sailboat in the Salish Sea, making art and love while discovering friends and other treasures along the way. Merely a course heading adjustment Sky...I have to believe things happen for reasons that enable us to grow and shake up our awareness! Thanks, Captain. You are an inspiration. I hope to have you aboard in July.